Bristol Royal Infirmary was once voted one of the ugliest buildings in Bristol. As part of a £92 million pound programme to redevelop the hospital - including a new Welcome Centre, wardblock and helideck - a new facade is being installed along to transform the weathered building into a real landmark. The project has taken almost four years since we first launched the design competition, together with University Hospitals Bristol NHS Foundation Trust (UH Bristol) to select an artist or architect for the project. "We are pleased to announce that the BRI façade continues to make progress and it is anticipated work will complete in June. The façade is a part of a wider programme of redevelopment across the BRI. 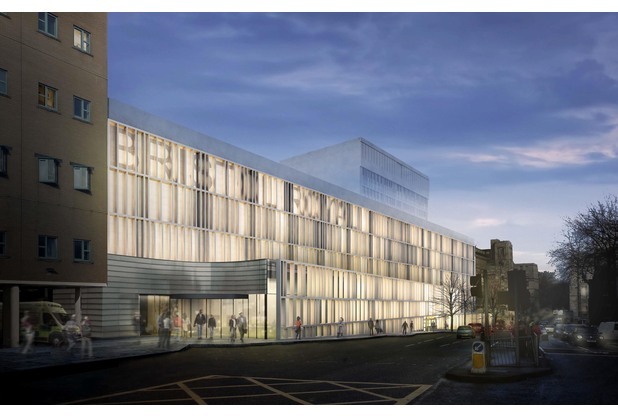 The concept began in 2012 when UH Bristol and arts consultancy Willis Newson launched an international design competition calling on international artists and architects to submit designs to improve the appearance of the façade of the BRI's Queen's Building. In 2013 the final design, by Nieto Sobejano, was selected and we are now excited to unveil the finished scheme." "We are delighted to see the results of the design competition taking shape, creating the right first impression of the excellent care delivered by the team at the Bristol Royal Infirmary." Read the full story on the Bristol Post website.